Marks & Spencer has appointed former Tesco marketer Sharry Cramond as marketing director, food and hospitality, as the retailer responds to falling sales across the board. Cramond joins from Florida-based Southeastern Grocers, where she has been chief marketing officer since May 2015. She had two stints at Tesco: from 1998 to 2009, and 2013 to 2015, when she was group marketing strategy and brand director, then proposition and brand marketing director. At the same time, Nathan Ansell will remain marketing director, but see his remit change from customer and loyalty to clothing and home. Meanwhile Rob Weston, currently global brand and marketing director, will become marketing director, brand and customer. All three will report to Patrick Bousquet-Chavanne, executive director, customer, marketing and digital. EasyJet chief commercial officer Peter Duffy has left easyJet. The move follows the arrival of new chief executive Johan Lundgren who has replaced Duffy's role with a chief data officer post. Duffy joined easyJet nearly eight years ago from Audi as marketing director. In 2016, he was promoted to chief commercial officer giving him sole oversight over revenue generation. Nick Law, the global chief creative officer of R/GA, is leaving the company after 17 years to take on the newly created role of chief creative officer across Publicis Groupe and president of Publicis Communications. Law will report to Publicis Groupe’s chairman and CEO Arthur Sadoun, who said that Law’s role will be to nurture and drive the creative talent across all Groupe companies, combining the power of data and creativity to deliver the best creative solutions for clients. Guy Marks has been named as the chief executive of OMD's EMEA region and Brian Crotty as chief executive of Latam. Marks, who is British, previously founded and sold two mobile marketing agencies, Blue Star Mobile and Mobile 5 – the latter to Omnicom. Crotty, who is Australian, was most recently vice-president of media for creative network AlmapBBDO Brazil, a part of Omnicom, and he has also worked for Digitas and run a consultancy, Babelfish. Starcom has recruited Hamid Habib from rival media agency OMD to be UK managing director. Publicis Groupe-owned Starcom said Habib’s role will be to "develop the agency’s local business". Habib, the chief strategy and innovation officer at OMD UK, has worked at the Omnicom agency since 2012. McCann Worldgroup UK has promoted McCann London's executive vice-president Rob Smith to the new role of chief client officer. Smith will focus on growing the group’s integrated offer and developing best practice for clients. Since joining McCann in September 2014, Smith has led the dedicated Microsoft and Xbox team, M:United, for McCann Worldgroup, as well as being the client leader on the agency’s Mastercard account. His previous role was at M&C Saatchi and prior to this he spent five years at Ogilvy & Mather, the last three of these as managing director. TUI's head of innovation, Jo Hickson, has moved to AKQA to take on the newly-created role of head of technology. Hickson will lead the agency's core practice out of its London studio and will report to managing director Sam Kelly. During her year-and-a-half at TUI, Hickson managed its product and service development around the customer experience. WCRS has promoted head of account management Annie Gallimore to managing director. Gallimore joined the agency’s parent group Engine in 2013 to run its government business and oversaw the multi-award winning NHS Blood & Transplant "Missing Type" campaign, in which Campaign took part alongside a number of UK brands. She was promoted to head of account management at WCRS in 2017. Mark Singleton has left his role at Paddy Power Betfair to take the top marketing job at Photobox. Singleton spent six years with Paddy Power Betfair and was recently brand and marketing director. Prior to that role he was head of multichannel and head of sportsbook marketing. As chief marketing officer at Photobox, Singleton will be taking ownership of the full marketing mix with the goal of driving customer acquisition and retention. VCCP has promoted creative partners Dan Glover-James and Elias Torres to associate creative directors. Since joining VCCP in 2011, the agency has created work for Nationwide, easyJet and O2, including the latter’s "Be more dog" campaign. McCann London has nabbed creative team Alex Dunning and Erik Uvhagen from Grey London. Dunning and Uvhagen join McCann as senior creatives. Before Grey, Dunning worked in art direction at Weapon7 and Uvhagen was based in Sweden as a copywriter. McCann London has also hired Zena Bruges as creative services director. Bruges was managing director at The Future Laboratory from 2012 to 2014, before becoming a full time consultant and mentor. She launched consultancy The Business Side in 2016. Lucky Generals has promoted Vickie Ridley to head of new business, the first time it has appointed someone directly to the role. Ridley joined the agency in 2015 from Rainey Kelly Campbell Roalfe/Y&R, where she worked on the BBC and Lloyds Bank accounts. At Lucky Generals she has been instrumental in winning pitches for Yorkshire Tea and Taylors of Harrogate, as well as global projects from AB InBev. Pulse Films has signed Academy Award-winning director James Marsh to its global roster. Marsh is a director of feature films, documentaries and commercials. He is known for films including Oscar-winning documentary Man on Wire and The Theory of Everything, and has also directed ads for Audi, Coca-Cola and the BBC. Director Vince Squibb has joined Academy for worldwide representation. He has previously won directing awards for the likes of Lurpak, HSBC, Transport for London and McDonald’s. Before he was a director Squibb worked as a copywriter at Lowe. Academy has also promoted producer Medb Riordan to work alongside Simon Cooper as joint managing director of the production company. She has been at Academy for 10 years, starting in reception. Lucy Gossage, a 17-year Academy veteran, has also been promoted to become executive producer and head of production. The reshuffle sees owner Lizie Gower take more of an ambassadorial role in the company she founded 34 years ago. The Mill London has promoted Jonathan Westley to executive creative director. Westley has worked at The Mill for more than a decade as head of 2D and creative director. Director Henry Busby has signed to Rattling Stick for UK and US representation. Busby won the D&AD Next Director award in 2017. Director Gudmundur Arnar Gudmundsson has signed to The Sweet Shop for international representation. An Icelandic director based in Denmark, his feature and short films such as 2013’s Whale Valley, about the bond between two brothers, have won awards and been selected for more than 200 festivals. Tracey Barber, previously chief marketing officer for Havas UK’s creative agencies, has been promoted to the new position of group chief marketing officer. This new, expanded remit now covers all of Havas’ UK agencies, including its media business. Barber takes on sole responsibility for all marketing, new business and PR activity across the group, which includes creative agency Havas London, customer engagement and data agency Havas helia, and media agencies Havas Media and Arena Media. Viacom International Media Networks (VIMN) has promoted Mark Kingston to senior vice president of Nickelodeon and Viacom Consumer Products. Kingston joined the company in 2011, as vice president of European licensing, retail sales and trade marketing. Prior to Nickelodeon, Kingston held various roles at The Walt Disney Company and BBC Worldwide, having started his career at Mars UK. He replaces Ron Johnson who has left the company. Kantar TNS UK has promoted Amy Cashman to UK managing director. Cashman joined in 1998 as a graduate trainee and has held a number of positions across the business including both team management and business development roles in a variety of client sectors. Since 2013 she has led the Financial Services & Technology team which has grown consistently year-on-year during that period. Since 2016 she has also been the overall Kantar UK lead for financial services clients. Creative England chief marketing and strategy officer and former Universal and Nintendo marketer Dawn Paine is leaving her role. She joined the funding agency in summer 2015. Merkle has promoted Thomas Byrne as senior vice president of agency services EMEA to lead its agency operations across EMEA. Prior to his new role, Byrne was vice president growth and partnerships at Merkle, and was previously responsible for growing Periscopix, which he joined in 2009 and was acquired by Merkle in 2015. He played a leading role in taking the agency from 20 to over 280 people. MC&C has announced the appointment of Barclays’ Nicola Shepherd-Banks as chief client officer, Havas Group UK’s Emily Underhill as new business director and Quadrangle Research Group Limited’s Ali Sargeant as head of people. All three new hires will report in Robin Trust, who was promoted to managing director in November 2017. Future has appointed Will Hattam as chief marketing officer. He joins from Archant where most recently, he served as in the same role. Previous to Archant, he has held senior leadership roles in Trinity Mirror Group & Bauer Media. Social Chain Group has named Matt Breen as commercial director, Michael Hodkinson as sales director, Sharlene Hanley as planning director, Paul Stevens as operations director and Adam Mills as head of talent & development. 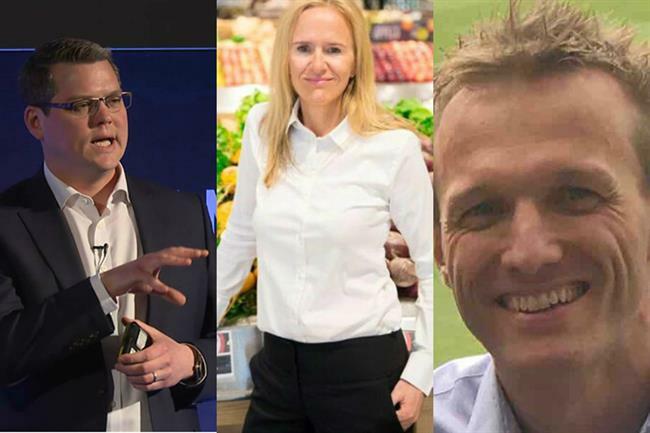 Breen joins from MailOnline, Hodkinson was director of Spark - Regions, The Telegraph's in house creative solutions department, while Hanley was most recently, content and partnerships at ITV. Stevens joins from MediaCom while Mills was previously at McCann. Drum, Omnicom Media Group UK’s (OMG UK) content agency, has appointed Laura Clark and Elliott Starr as creatives. They join from Fallon.